Something new for me on this blog, a physical invention. I made a prototype with an idea of making them and selling them. It's designed to satisfy a personal niggle - it annoys me taking the lids off every time I want to see if they are full or empty. I then researched patents etc and decided it was a non-starter so here it is for you to make your own and for the good of the world. It's nothing ground breaking but I'm quite pleased with it. Contact me if you want me to make you one, I could sell them through ebay if there's a demand. 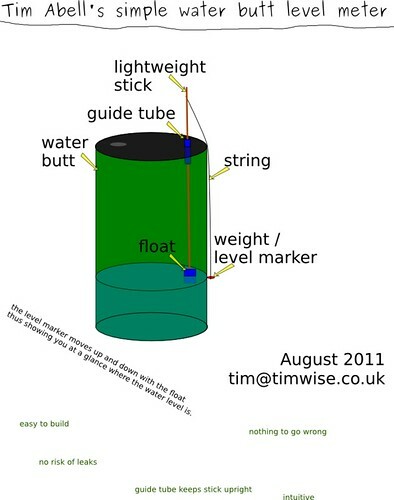 To make it pretty I was thinking of putting a little fisherman on top with his rod holding the string for the level meter... (this would have the practical advantage of keeping the string straighter thus avoiding some of the error introduced by the bend in the simplest version). it's a bit dark in there. can you get such a thing?